Some 43 points off his team mate at the championship table top, in a season in which nothing it seemed would go his way. And some 87% of F1 races at this circuit this millennium have been won from pole position. Make no mistake about it, Lewis Hamilton simply had to deliver in this one. And he did. And he did it when for the most of the Spanish Grand Prix weekend before it the outcome appeared far from likely; like things would not go for him once again. Lewis's Mercedes had looked evil on track for most of the time in Montmelo and with it a deficit of a couple of tenths or more per lap to stable mate Nico Rosberg lingered persistently. Complicating matters further the Ferraris were right there too it seemed, with one post-Friday analysis declaring the Scuderia challenge as "the closest it's been [to Merc] since testing". 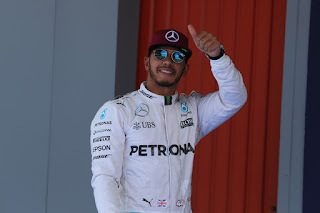 Not much changed outwardly at the start of qualifying either, and it looked like Lewis's only hope was something akin to what he did in Bahrain's qualifying earlier in the year, which was simply to pull a rabbit out of the hat at the last. But Lewis did find something, and something a bit more tangible than he had scavenged at Sakhir. The second part of today's qualifying session revealed it. Nico took a quarter of a second off his own Q1 time, but Lewis whizzed around a full six tenths under it, cutting the beam at 1:22.159, to accompanying gasps. That was the fork in the road, and while there threatened to be a pendulum swing back to Nico in Q3 when Lewis made a mess of his first run, clearly the pace required was there as Nico still didn't match Lewis's Q2 mark. In his final effort he got it right, setting a time of 1m 22 seconds dead; pole was Lewis's by an almost balmy 0.280 seconds. And afterwards he was justifiably pleased. "Very, very happy with getting the lap" he said. "Nico has been very strong all weekend so it was crucial that bit-by-bit, a stepping-stone, I've been really trying to put the pace together." Lewis couldn't resist dropping in a reminder either that, in the qualifying sessions he could complete without technical problems at least, he is yet to be beaten in 2016: "This is three out of three for me, so I'm pretty happy. I didn't get to compete in the last two qualifying sessions so I'm very happy with it and very grateful. The car was great, yesterday was a bit of difficult day so to be able to start the on the right foot today is the best thing." He admitted too that in getting one over Nico this time, imitation was the sincerest form of flattery. 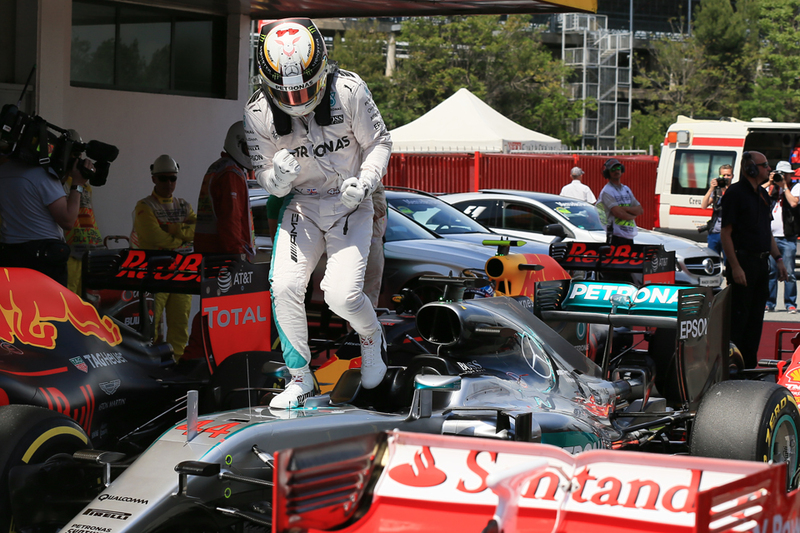 "Nico was comfortable with the car, so we went more in line with the [set-up] direction he was going" Lewis conceded. "We weren't very far away. To have the car beneath me again was a real relief." Rosberg though, again justifiably given everything, didn't appear too downbeat. "For sure I'm disappointed to be second" he said with a smile, "I wanted to be first today, of course, but Lewis was just quicker in qualifying today and that's it. It'll likely again just be the two of them competing for the win indeed. The Mercedes as anticipated - before Friday at least - had the Montmelo circuit to themselves, and underlining just how much this track accentuates the positives of the silver machine the P3 time we got today of a whole 0.680 of a second off the top was in fact the closest any non-Merc has got to pole here since 2013. It's not a track known for overtaking, so as Nico predicted the start plus any minor strategy variation (and at Mercedes it tends to be minor) is likely to be his best hope of reversing the places. He'll also hope that Lewis's poor longer runs from Friday have not been resolved. Still there was no shortage of stories elsewhere. And a couple of big ones were down Red Bull way. 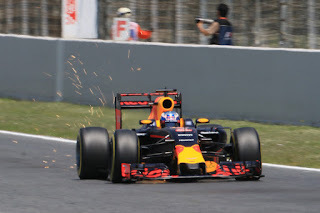 As we know this was the scene of young Max Verstappen's bow in the Red Bull big team, and for the most part he stepped right in by leaving even Daniel Ricciardo behind and being the best of the rest behind the silver lot. 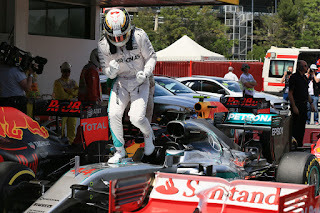 Indeed he even split the Mercedes in Q3 for a time after Hamilton fluffed his first go. The redolence of Michael Schumacher and others was distinct. Say what you like about Dr Marko et al but they tend to get these driver decisions right. But just like the pole man Ricciardo pulled it out when it mattered and despite only getting one go at Q3 set a time four tenths better than even Max could muster. Little wonder he was whooping on the slowing down lap. In fickle F1 this mere hour of qualifying threatened to put a dent into his pristine reputation. It's encouraging times for Red Bull generally, with clearly an effective chassis, two superb drivers, Monaco (which should suit its car) next then apparently an upgraded Renault unit due for Canada. Perhaps sneaking ahead of one Ferrari was on today's agenda but getting ahead of both, and with both cars, was as Ricciardo and his boss Christian Horner admitted, definitely not. "For both of us to be in front of Ferrari and on the second row, I thought maybe one of us could sneak in and get a P4 and split the Ferraris but to both be in front is really cool" said Ricciardo later. And as for his new challenger across the garage? "We know from the start Max is quick and he's shown that throughout, also yesterday he showed speed as well" said Ricciardo. "It's been a good start for him and I think for us as a team really good for this weekend. "Your mentality is you need to beat everyone" he went on. "Sure, my Q2 definitely didn't go as good as his. His first lap was on the money...even the second lap I did in Q2 wasn't great. So sure, I knew there was more to come in Q3 - but also I knew where the time was and I knew just putting it all together would give us a bit of lap time. So, I think the only disadvantage coming into Q3 was that I knew I just had one set of tyres - but [I've] been in that position before and, sure, it creates a bit of excitement." And as for Ferrari? The eagle-eyed among you will have noticed the disconnect between its pre-quali expectations and that as implied no red car will be present on the first two rows tomorrow. They'll fill the third row with Kimi Raikkonen ahead though, but that's unlikely to be much of a comfort, particularly for a squad with its hardly timid company CEO in Sergio Marchionne apparently turning up the heat gradually in recent times. An air of bewilderment at its loss of pace hung around the Ferrari camp afterwards. 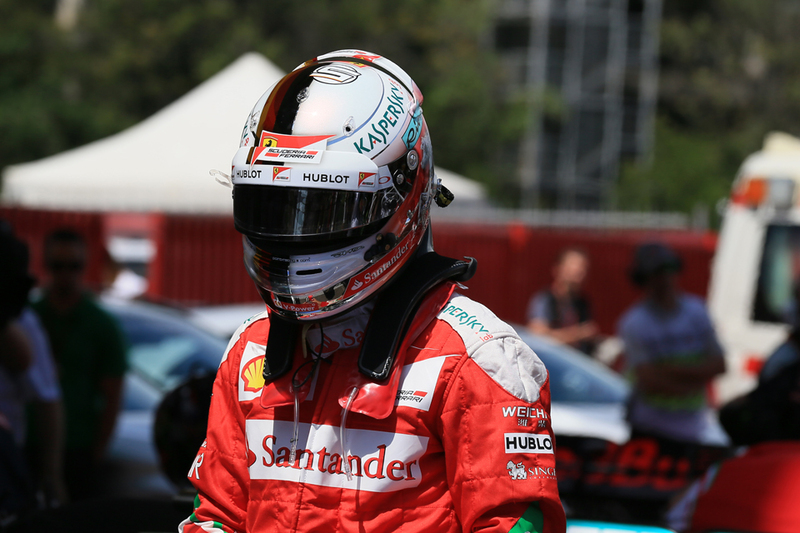 "It was a surprise to us as it was to you," Sebastian Vettel conceded. "Currently we don't yet understand but I'm sure there was a reason for it...The car was not behaving similar to what we've had all weekend." Kimi concurred. "Yes we changed the car [for qualifying], but we are faster than we were this morning...We went forward, but for whatever reason we struggled a bit and the others did a better job." Team principal Maurizio Arrivabene summed it up: "We need to check now what happened..."
And while this was going on the Scuderia's old flame Fernando Alonso was by contrast edging upwards. 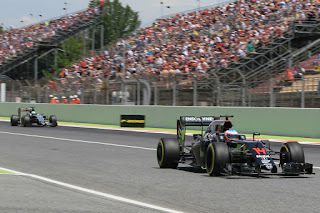 For the first time since the famous partnership was rekindled a McLaren Honda made it into the final part of qualifying, in Alonso's hands in P10. He's looked in good form this weekend, as indeed he has for most of this season, shorn of the self-confessed "economy mode" of the previous campaign. And about as suddenly some are beginning to murmur that his parting from Ferrari - whoever initiated it - for a man for whom the third title is the thing may not have been such a bad move after all. 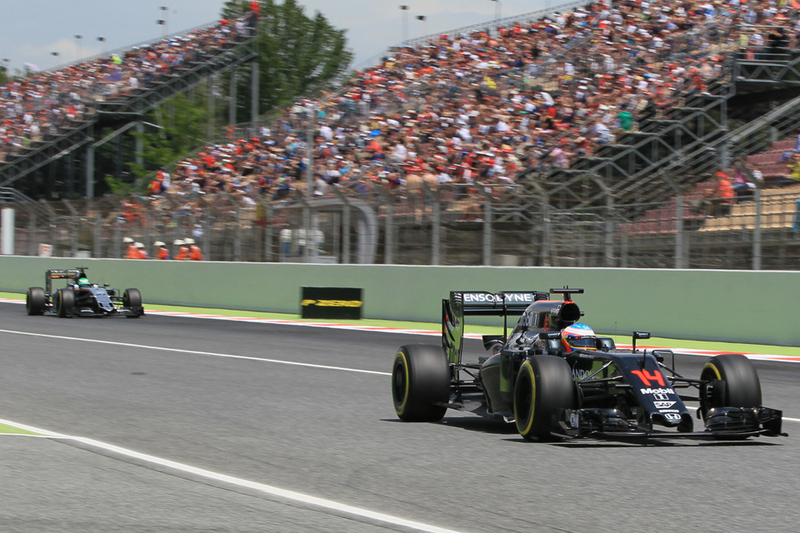 While for the McLaren Honda it's another clear marker of progress. Nando reminded us all afterwards though that it was but the latest small marker on their long mountain trek back to the high peak of the world championship. And he is another that can look forward with optimism, particularly for the next round in Monaco, as in the third sector here, considered a good guide to principality pace, only the Mercs and Red Bulls were quicker than he. How quickly things can look very different in this game.